Our Halloween version of the classic martini may get you a few puzzled looks around the party. The great thing about this cocktail is that your drink can stare right back at them. Create your mad eyeball with a peeled radish and an olive stuffed with pimento, instructions are below. 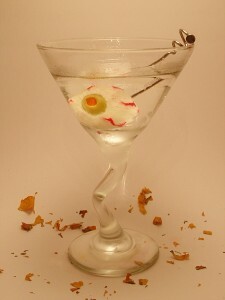 Cheers and Happy Hallowe’en from Madtini.